*explanation of ASA policy for Illegal Use of Logo and False Statements is below. The ASA Logos are recognized internationally as a symbol of quality and strong business commitment. All ASA members are eligible to use the ASA Member Logo. ASA-100 accredited companies are eligible to use the ASA-100 Accredited Logo. Companies certified to ISO 9001:2008 through ASACB may use the ASACB logo. ASA requires companies to first sign a logo license agreement which details the terms of the license and the manner in which the Logo may be used. Occasionally, ASA learns of companies that are using an ASA Logo without permission. This is a violation of ASA's trademark, and it diminishes the quality of the ASA Logos for those companies that are using it properly. ASA strongly enforces its trademark associated with its logos and shall enforce its rights under law regarding any unauthorized use of its logos. Notices of Infringement on this trademark are listed below. ASA defends itself against false statements by companies/individuals regarding membership, ASA-100 accreditation, ISO 9001 certification, etc. These statements may or may not involve the use of the logo. 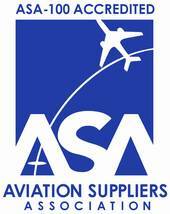 To report illegal use of ASA's logo, please contact ASA info@aviationsuppliers.org or 202-347-6899. As of January 1, 2010, all ASA Members renewing in the 2010 calendar year will receive a new membership certificate with a printed expiration date. Renewing members will receive new certificates each year after renewal.